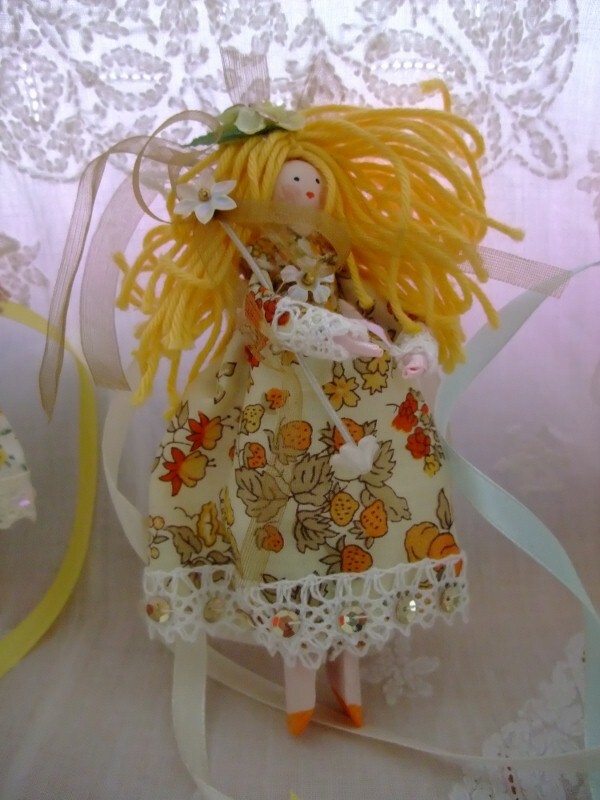 OK fairy lovers, I have finally got my act together to give some instructions on how to make a vintage inspired fairy peg doll (or clothespin doll). These are perfect for adorning bedrooms, as bridesmaid gifts, and of course on top of Christmas trees! I usually make them in batches of say 6 at a time in a little mini production line! If paint is now dry, paint or glue ribbon onto feet to create toning shoes; draw features on face - I use 2 small black dots for eyes, a teensy red heart for mouth and two small rosy cheeks of a touch of blusher rubbed on with a cotton bud/Q tip. Face painting is more tricky than it seems, if all goes wrong, try on the other side and you can cover the ugly face with hair later!! Assemble clothes on doll: glue knickers pieces into tubes, put glue round tops of legs and position; glue petticoat to form a tube, glue over top of knickers; gather waist edge of dress skirt and tie onto doll, put glue under top edge to secure; glue arms at back of doll; take bodice crossover and place on back of neck, cross over front, bring round back, trim and glue in place; glue sash in place at waistline over top edge of skirt. Doll should now be dressed. Trim dress with beads, sequins etc. Cut a piece of ribbon approx. 60cm long. Stitch this securely to centre back of arms/bodice as this will tie the fairy to trees & other alighting points. Take your butterfly wings and stitch to back of fairy. 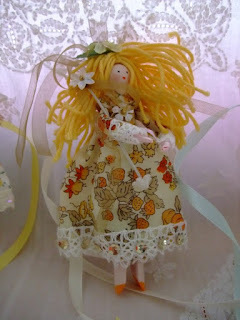 Time to put on the hair - this can get in the way of dressing the doll so best to leave until last. For long hair, cut lengths of embroidery thread approx. 9cm long, tie in the centre and then glue and arrange on head. Bobbled knitting yarn can be piled up high a la Duchess of Devonshire - glue and stitch as you go. 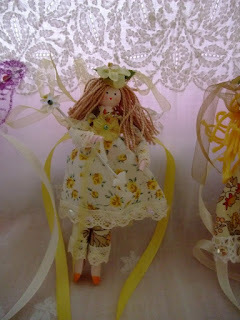 Decorate with lace, ribbon, rosebuds, felt hats as you wish. Last of all, the wand! Cut a length of wire (I use millinery wire) approx. 5.5cm long. Cover with ribbon, glue beads and ribbon onto the end and then secure with a couple of stitches to the fairy's arm. These look so wonderful I am definitely going to have a go and make some although I think my efforts might end up looking rather more on the "disturbed" side. There is more than one disturbed face hidden beneath the hair of my fairies, I can tell you!